Please refer to our stock # 612 when inquiring. 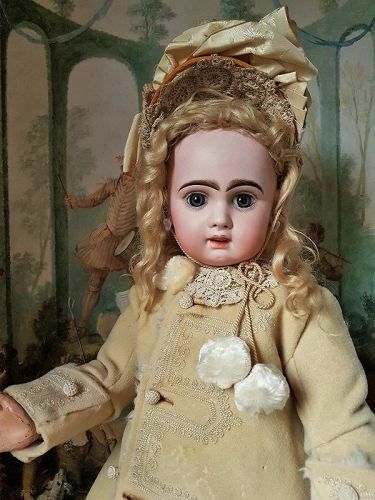 She is one of the most beautiful girls by Maison Jumeau 26 " ( 66 cm ) .... has best quality pale bisque socket head with large blue glass paperweight inset eyes , thick black eyeliner and fine lushly painted lashes . Brush-stroked and feathered brows and open mouth with row of porcelain teeth between her shaded and outlined lips. She has pierced ears and original blonde curled mohair wig ( missing hair at back ...please see pictures ) over paper-mache pate . Original French composition and wooden fully jointed body with original body finish and Jumeau paper label at back . Here complete condition is generally excellent , bisque is free of damage , repair , hairline or chip . The body has well done color repair at shoulders , feet and right hand with one finger repair . All around very pretty and childlike girl ........ ready to display and enjoy in your collection !! Let me know if you have any question or if you need more or special pictures ! Thank you for your interest on my Doll - Shop !! Layaway are always welcome , please ask me about.... thank you ! !